by Douglas Martin. The New York Times, March 14, 2011. Donny George with Assyrian reliefs at the museum in Baghdad. He fled Iraq in 2006 because of threats to his family. Max Becherer/Polaris, for The New York Times. 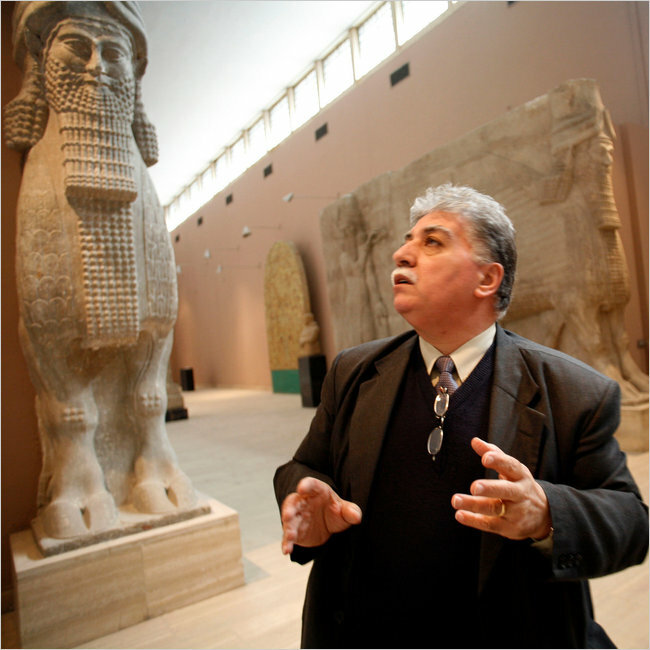 Donny George, an esteemed Iraqi archaeologist who tried to stop the looters ransacking the Iraq National Museum after the invasion of 2003, then led in recovering thousands of stolen artifacts in the ensuing years, died on Friday in Toronto. He was 60. His friend Gwendolen Cates, a documentary filmmaker and photographer, said he had a heart attack in the Toronto airport. Dr. George fled Iraq in 2006 because of threats to his family. He was also angry that Iraq’s post-invasion politicians seemed interested mainly in archaeology pertaining to the Islamic conquest in the seventh century and its aftermath. His passions were the older civilizations of the Sumerians, the Babylonians, the Assyrians. He directed a major excavation of Babylon. Dr. George was director of research for the State Board of Antiquities and Heritage when United States troops and their allies invaded Iraq. He fought through blocked bridges, explosions and troops to report to the museum in the chaotic days afterward, finding he could not persuade American troops to protect it because no order had been issued to do so. An estimated 15,000 artifacts were stolen, less than a tenth the initial guesses. Working with Col. Matthew Bogdanos of the Marines to investigate the thefts, they recovered half the stolen the artifacts, partly by granting looters amnesty. Dr. George soon became head of the museum, then chairman of the antiquities board, replacing a cousin of Saddam Hussein. He slowly put the museum back together, rebuilding damaged walls, fixing the plumbing, installing guard houses and much else. He obtained aid from Italy to build a new Assyrian hall and started a conservation training program. He also moved to protect Iraq’s many archaeological sites, establishing an archaeological police force with vehicles and weapons. Elizabeth Stone, an anthropology professor at Stony Brook University on Long Island, said the force was effective at first, then sputtered. Professor Stone said Dr. George’s success in rising to the top of Iraq’s archaeological establishment was remarkable because he was Christian — the first of that faith to achieve that stature. But being a Christian was also what ultimately prompted him to flee the country. He left after receiving an envelope containing a Kalashnikov bullet and a letter accusing his younger son of disrespecting Islam and threatening his life. Dr. George first went to Syria, then to the United States, where he became a professor of anthropology, then of Asian studies, at Stony Brook. Donny George Youkhanna was born in Habania, Iraq, on Oct. 23, 1950. His father worked at the British Consulate. An Assyrian Christian, Dr. George dropped his last name for professional purposes. He grew up fishing with his father, hunting with his grandfather and leading scout expeditions. He was sent to study English literature at Baghdad University but was steered toward a French literature class that held no interest for him. He went to see the assistant dean, who told him the only other opening was in archaeology. “I asked if that meant living in tents and excavating sites, and when he said yes, I jumped at the opportunity,” he said in an interview with The New York Times in 2006. He earned undergraduate, master’s and doctoral degrees in archaeology from Baghdad University, then went to work for the government antiquities board. Fluent in English, he was sent to many international conferences, where he developed a web of contacts. He became a member of Saddam’s Baath Party, which meant praising the dictator in public. Professor Stone said it would have been impossible for him to hold the high positions he did without participating in the party in at least minor ways. He would often joke that he worked at faraway digs to avoid party meetings. But Dr. George believed that even this degree of loyalty was enough to make him a target for revenge by the conservative Shiites, who came to dominate Iraqi politics after the invasion. Dr. George, who was a drummer in a rock band in his spare time, is survived by his wife, Najat Sarkees; his daughter, Mariam George; and his sons Steven and Martin. Iraqi government officials dismissed Dr. George’s criticism that they had not done enough to safeguard the country’s ancient relics. They called his complaints a ruse to flee to the United States. He shrugged this off, saying archaeologists take a longer view.